24 Hours Blogging!..... 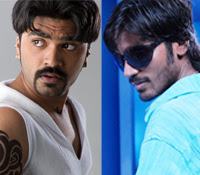 : Simbu,dhanush to team up! It is being reported in trade circles that Dhanush and Silambarasan will team up for a film to be directed by Prabhudeva. Even though both have denied it, the two young actors are considered to be arch-rivals in the industry. The two display great camaraderie in public functions. Recently, the two were seen greeting each other with a warm hug at a preview show in the city. Recently, Prabhudeva had met Silambarasan to narrate a story. The choreographer-turned-director is currently directing Salman Khan for the Pokkiri remake, Wanted Dead or Alive. After this, he will be teaming up with Vijay, with whom he gave Pokkiri, for a film to be produced by Ayngaran Films International. Sources say that Prabhudeva will make the Dhanush-Simbu movie, tentatively titled Agni Natchathiram, after completing these two projects. However, it is not known whether the movie will be a remake of Mani Ratnam’s classic with the same name.